The 138 acre selection of land on the left hand side of St Georges road, including the land between Emerald Road and McBride Road is known as Allotment 66 in the Parish of Pakenham. It was originally selected by a clerk/farmer called Arthur Knight, who lived there together with his mother. He obtained his crown grant on 25 August 1881. Knight sold off parts of his selection to Elizabeth Rushall, Catherine Walsh and Joseph Bulling before a subdivision was finalised in October 1886. In 1883 he had donated an acre of land for the purpose of building a church. The balance of the land, about 100 acres, was transferred to Walter Smythe Bayston on 25 October 1888, after he had lodged a caveat on 30 August 1888. Bayston was later mayor of Caulfield. On 3 November 1888 another caveat was lodged, and as it lapsed on the same day that the property was transferred into the name of Thomas Barrett, a builder, there are grounds to assume that he may have been contracted to build a house for Bayston, and defaulted. On 7 August 1891 Barrett took out a mortgage from the Commercial Bank of Australia. From the rate books we know that the property had a house on it by 1890, but it is not known on which lot the house was built on. The net annual value of £125 suggests that the house was quite substantial. The same value was used to calculate the council rates in the following two years, but the 1892 rates were already paid by the Commercial Bank, so Barrett must have defaulted this mortgage shortly after obtaining it. The dire economic situation during the 1890s made the council adjust the rates, and in 1893 and 1894 the net annual value is reduced to £35, then for the next two years to £25 each year. On 2 September 1895 the Commercial Bank sold the first lot of this land, but it was not until 14 September 1912 that lot 9 was sold to James Ramage and James Joseph Ahern, both employees of the Shire of Pakenham. Ramage was Clerk of Works for many years and Ahern the Shire Secretary, then taking on some of Ramage’s duties after Ramage’s retirement. Ramage and Ahern are rated £10 in the first year, and £16 the following year. The 1914 rates are then paid by Emily Josephine Martin, the wife of Frederick Charles Martin. Like his brother George Wilson Martin, Frederick had substantial landholdings in Upper Beaconsfield. The transfer into Frederick’s name is only registered on 29 August 1917, but it is likely that the Martins used the land before that date. The Martins paid rates for this property for about 9 years, and when it is sold in December 1924, the Argus reported that Alston had been sold on behalf of Frederick Martin to Mr Collie. The title is transferred on 23 Feb 1925 to Asprey James Collie, an electrical engineer. At least two other properties belonging to Frederick Martin carried the name Alston. It was a peculiar custom for people to name their Melbourne residence the same as their holiday house. Not much is known about the Collies, but they never registered their address as Upper Beaconsfield, so it can be assumed that they used Alston as a weekender. Although the transfer to Mabel Lilian Mortagne was only registered 18 August 1932, she appears to have lived at Alston from about 1928, as she was listed on the electoral roll until 1931. It was Collie who paid the rates from 1923 until 1931. Ms Mortagne was married to a French woolbuyer in 1893, but they divorced in 1902. It was not until 1931 that Mabel realised that she had been stripped of her Australian nationality, common for women marrying foreigners. As she was now planning a trip to England via Canada, she needed to apply for naturalisation, which was granted. In her application in February 1931 she gives her address as Alston, Upper Beaconsfield. Helena Barnes, wife of Reginald Barnes (school teacher), bought the property per 3 April 1933 (according to the rate book), but it is only on 16 November 1933 year that a caveat is lodged, and the property is not transferred to her until 23 Sep 1938. By 1934 Helena gives her address in the rate book as Alston. Rates were £35 until 1939, then rose to £55 until 1946. From 1942 until 1949 Mr and Mrs Barnes are listed as residents of Alston, Reginald being retired, and Helena performing home duties. On 21 November 1949 Alston was sold to William Howard Hull, electrical engineer, and his wife Dorothy Emma, who lived in Caulfield, reportedly for a price of £3000. From 1947 until 1953 the rates were based on a NAV of £75, then until 1960 a NAV of £80. By 1950 the Hulls name the property Barkala. It was common during those days to find a nice-sounding Aboriginal name for your property, and lists appeared in newspapers. The Adelaide Advertiser published such a list on 19 Nov 1954, and “barkala” is listed with the meaning “shade made by bush.” The Argus on 4 Sep 1946 gives the explanation as “bush shades”. William Hull died in 1955. Their daughter Dorothy Faye married John David Morrison, who together with his mother and brother owned a property in Albers Road, later owned by the Vassies and the Timmins’. 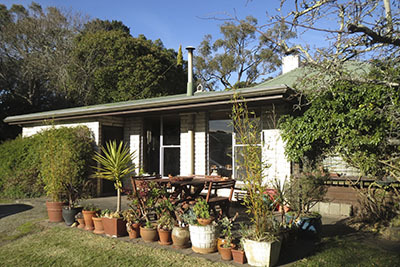 Dorothy Hull stayed at Barkala until her death in 1963, and her daughter sold the property to James and Mary Elizabeth Leishman in 1964 for £4,600. The Leishmans appear to have made alterations to the property by adding a veranda around the perimeter of the original house, and called it Hillhead Lodge. The rates were adjusted accordingly to a net annual value of £156. James Leishman was an engineer, born in Scotland, who migrated with his family to Australia when he was eight years old. According to George Moir, the property was leased to someone during the last few years of the Leishman's ownership. George and his wife Judy bought it in May 1977. They reverted the property’s name back to Barkala. 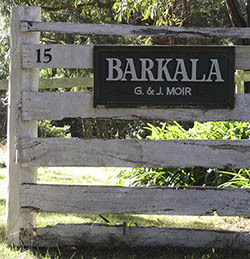 George Moir sold Barkala in August 2018.